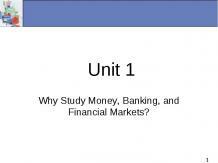 Why Study Money, Banking, and Financial Markets? Money The history of money spans thousands of years. Numismatics is the scientific study of money and its history in all its varied forms. 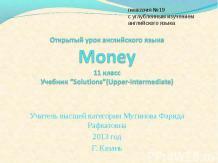 Modern money Modern money (and most ancient money) is essentially a token — in other words, an abstraction. Paper currency is perhaps the most common type of physical money today. However, objects of gold or silver present many of money's essential properties. Modern money (and most ancient money) is essentially a token — in other words, an abstraction. Paper currency is perhaps the most common type of physical money today. However, objects of gold or silver present many of money's essential properties. The emergence of money The Sumerian civilization developed a large scale economy based on commodity money. The Babylonians and their neighboring city states later developed the earliest system of economics as we think of it today, in terms of rules on debt, legal contracts and law codes relating to business practices and private property. The Code of Hammurabi, the best preserved ancient law code, was created ca.1760 BC (middle chronology) in ancient Babylon. It was enacted by the sixth Babylonian king, Hammurabi. Earlier collections of laws include the code of Ur-Nammu, king of Ur (ca. 2050 BC), the Code of Eshnunna (ca. 1930 BC) and the code of Lipit-Ishtar of Isin (ca. 1870 BC). These law codes formalized the role of money in civil society. They set amounts of interest on debt... fines for 'wrong doing'... and compensation in money for various infractions of formalized law. The Shekel referred to an ancient unit of weight and currency. The first usage of the term came from Mesopotamia circa 3000 BC. and referred to a specific mass of barley which related other values in a metric such as silver, bronze, copper etc. A barley/shekel was originally both a unit of currency and a unit of weight, just as the British Pound was originally a unit denominating a one pound mass of silver. In the absence of a medium of exchange, non-monetary societies operated largely along the principles of gift economics. When barter did in fact occur, it was usually between either complete strangers or would-be enemies. Standardized coinage From early times, metals, where available, have usually been favored for use as proto-money over such commodities as cattle, cowry shells, or salt, because they are at once durable, portable, and easily divisible. The use of gold as proto-money has been traced back to the fourth millennium B.C. when the Egyptians used gold bars of a set weight as a medium of exchange, as the Sumerians earlier had done with silver bars. The first known ruler who officially set standards of weight and money was Pheidon. The first stamped money (having the mark of some authority in the form of a picture or words) can be seen in the Bibliothèque Nationale of Paris. It is an electrum stater of a turtle coin, coined at Aegina island. This remarkable coin dates about 700 B.C. Electrum coins were also introduced about 650 B.C. in Lydia. From early times, metals, where available, have usually been favored for use as proto-money over such commodities as cattle, cowry shells, or salt, because they are at once durable, portable, and easily divisible. The use of gold as proto-money has been traced back to the fourth millennium B.C. when the Egyptians used gold bars of a set weight as a medium of exchange, as the Sumerians earlier had done with silver bars. The first known ruler who officially set standards of weight and money was Pheidon. The first stamped money (having the mark of some authority in the form of a picture or words) can be seen in the Bibliothèque Nationale of Paris. It is an electrum stater of a turtle coin, coined at Aegina island. This remarkable coin dates about 700 B.C. Electrum coins were also introduced about 650 B.C. in Lydia. Coinage was widely adopted across Ionia and mainland Greece during the 6th century B.C., eventually leading to the Athenian Empire's 5th century B.C., dominance of the region through their export of silver coinage, mined in southern Attica at Laurium and Thorikos. A major silver vein discovery at Laurium in 483 BC led to the huge expansion of the Athenian military fleet. Competing coinage standards at the time were maintained by Mytilene and Phokaia using coins of Electrum; Aegina used silver. It was the discovery of the touchstone which led the way for metal-based commodity money and coinage. Any soft metal can be tested for purity on a touchstone, allowing one to quickly calculate the total content of a particular metal in a lump. Gold is a soft metal, which is also hard to come by, dense, and storable. As a result, monetary gold spread very quickly from Asia Minor, where it first gained wide usage, to the entire world. Goldsmith bankers The highly successful ancient grain bank also served as a model for the emergence of the goldsmith bankers in 17th Century England. These were the early days of the mercantile revolution before the rise of the British Empire when merchant ships began plying the coastal seas laden with silks and spices from the orient and shrewd traders amassed huge hoards of gold in the bargain. Since no banks existed in England at the time, these entrepreneurs entrusted their wealth with the leading goldsmith of London, who already possessed stores of gold and private vaults within which to store it safely, and paid a fee for that service. In exchange for each deposit of precious metal, the goldsmiths issued paper receipts certifying the quantity and purity of the metal they held on deposit. Like the grain receipts, tallies and bills of exchange, the goldsmith receipts soon began to circulate as a safe and convenient form of money backed by gold and silver in the goldsmiths’ vaults. Knowing that goldsmiths were laden with gold, it was only natural that other traders in need of capital might approach them for loans, which the goldsmiths made to trustworthy parties out of their gold hoards in exchange for interest. Like the grain bankers, goldsmith began issuing loans by creating additional paper gold receipts that were generally accepted in trade and were indistinguishable from the receipts issued to parties that deposited gold. Both represented a promise to redeem the receipt in exchange for a certain amount of metal. Since no one other than the goldsmith knew how much gold he held in store and how much was the value of his receipts held by the public, he was able to issue receipts for greater value than the gold he held. Gold deposits were relatively stable, often remaining with the goldsmith for years on end, so there was little risk of default so long as public trust in the goldsmith's integrity and financial soundness was maintained. Thus, the goldsmiths of London became the forerunners of British banking and prominent creators of new money. They created money based on public trust. Banknotes The history of money and banking are inseparably interlinked. The issuance of paper money was initiated by commercial banks. Inspired by the success of the London goldsmiths, some of which became the forerunners of great English banks, banks began issuing paper notes quite properly termed ‘banknotes’ which circulated in the same way that government issued currency circulates today. In England this practice continued up to 1694. Scottish banks continued issuing notes until 1850. In USA, this practice continued through the 19th Century, where at one time there were more than 5000 different types of bank notes issued by various commercial banks in America. Only the notes issued by the largest, most creditworthy banks were widely accepted. The script of smaller, lesser known institutions circulated locally. Farther from home it was only accepted at a discounted rate, if it was accepted at all. The proliferation of types of money went hand in hand with a multiplication in the number of financial institutions. The history of money and banking are inseparably interlinked. The issuance of paper money was initiated by commercial banks. Inspired by the success of the London goldsmiths, some of which became the forerunners of great English banks, banks began issuing paper notes quite properly termed ‘banknotes’ which circulated in the same way that government issued currency circulates today. In England this practice continued up to 1694. Scottish banks continued issuing notes until 1850. In USA, this practice continued through the 19th Century, where at one time there were more than 5000 different types of bank notes issued by various commercial banks in America. Only the notes issued by the largest, most creditworthy banks were widely accepted. The script of smaller, lesser known institutions circulated locally. Farther from home it was only accepted at a discounted rate, if it was accepted at all. The proliferation of types of money went hand in hand with a multiplication in the number of financial institutions. These banknotes were a form of representative money which could be converted into gold or silver by application at the bank. Since banks issued notes far in excess of the gold and silver they kept on deposit, sudden loss of public confidence in a bank could precipitate mass redemption of banknotes and result in bankruptcy. The use of bank notes issued by private commercial banks as legal tender has gradually been replaced by the issuance of bank notes authorized and controlled by national governments. The Bank of England was granted sole rights to issue banknotes in England after 1694. In the USA, the Federal Reserve Bank was granted similar rights after its establishment in 1913. Until recently, these government-authorized currencies were forms of representative money, since they were partially backed by gold or silver and were theoretically convertible into gold or silver. Money, in some form,&nbsp;has been part of human history for at least the last 3,000 years. Before that time, it is assumed that a system of bartering was likely used.&nbsp; Bartering is&nbsp;a direct trade of goods and services - I'll give you a stone axe if you help me kill&nbsp;a mammoth - but such arrangements take time. You have to find someone who thinks an axe is a fair trade for having to face the 12-foot tusks on a beast that doesn't take kindly to being hunted. If that didn't work, you would have to alter the deal until someone agreed to the terms. One of the great achievements of money was increasing the speed at which business, whether mammoth slaying or monument building, could be done. Slowly, a type of prehistoric currency involving easily traded goods like animal skins, salt and weapons developed over the centuries. These traded goods served as the&nbsp;medium of exchange even though the unit values were still negotiable. This system of barter and trade spread across the world, and it still survives today on some parts of the globe.